A total of 27 players were chosen by 18 Ontario Hockey League clubs in the 2018 CHL Import Draft process including 16 forwards, seven defencemen, four goaltenders, and a total of nine different countries represented. 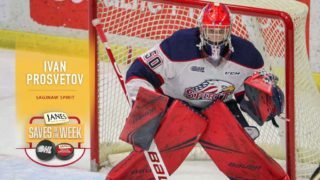 The first goaltender chosen in the CHL Import Draft since 2013, Buffalo Sabres prospect Ukko-Pekka Luukkonen joins the Sudbury Wolves who were the first OHL club to select in Thursday’s draft. The 6’4, 196lb, 19-year-old Finnish netminder, recently signed an entry-level contract with the Sabres who selected him in the second round a year ago. Luukkonen represented his country in Buffalo at the 2018 IIHF World Junior Championship. 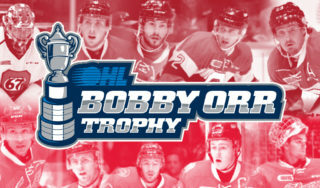 Some of the most recent import goaltenders to have OHL success include Oscar Dansk (Erie 2014), Mathias Niederberger (Barrie 2013), Petr Mrazek (Ottawa 2012), Philipp Grubauer (Kingston 2011), and Robin Lehner (Sault Ste. Marie 2010). The last time the Wolves selected third overall in this process was 2015 when they picked Russian forward Dmitry Sokolov who had one of the most successful OHL careers in Import Draft history. 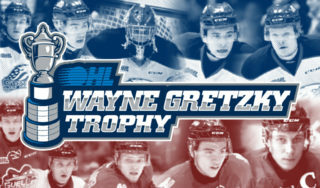 He played three OHL seasons and scored 128 goals in 196 games which is more than any other player chosen in the draft. Jan Jeník, a native of Nymburk, Czech Republic, was recently selected by the Arizona Coyotes in the third round (65th overall) of the 2018 NHL Draft. He recorded an impressive 15 points (7G, 8A) in 19 international games with Czech Republic’s National Men’s U-18 Team during the 2017-18 season. At the 2017 U-18 World Championship in Russia, Jeník tallied six assists, including a plus-one rating and 13 shots on goal in seven games. Liam Kirk made history last weekend as the first British born and trained player to be selected in the NHL Draft chosen in the seventh round by the Arizona Coyotes. The 6’1”, 160lbs 2000-born left winger played for the Sheffield Steelers in the EIHL in 2017-18. In 52 games, Kirk recorded 9 goals, 7 assists, and 16 points – the third-highest point total ever in the EIHL by an under-19 player. Cajka, a 6’0”, 163-pound forward, appeared in 38 games for Zug of the Switzerland Elite Jr. A league during the 2017-18 season, tallying eight goals and 21 points, while adding another goal and two points in eight playoff games. The Kadan, Czech Republic, born forward suited up for his home country at the 2018 U18 World Junior Championship in Russia this past spring where he scored a goal and recorded three points in seven games. Prosvetov, 19, hails from Moscow, Russia, and played the 2017-18 season with the Youngstown Phantoms in the United States Hockey League. 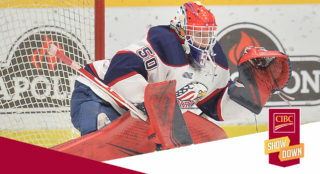 He appeared in 36 regular season games, recording 19 wins with a 2.90 goals-against-average and a .913 save percentage before being selected in the fourth round of the 2018 NHL Draft by the Arizona Coyotes. A top prospect eligible for the 2020 NHL Draft, Rossi put up 51 points in 34 games for the GCK Lions U-20 club as a 16-year-old last year. The Austrian forward also played 18 games against men for the GC Küsnacht Lions, in which he had four goals and three assists. Postnov scored 17 goals and earned 12 assists for 29 points while accumulating 34 penalty minutes in 63 games with Stupino Capitan of the MHL, or Youth Hockey League, last season. The Moscow, Russia, resident, who turned 18 on April 19, stands six feet and weighs 156 pounds. Piiroinen, who will turn 17 this Sunday (July 1st) is 6’0 and 161 pounds, and in 27 games with HIFK U-18s last season, posted a 2.73 goals against average and a .912 save percentage before an impressive 1.00 goals against and .957 save percentage in five playoff games. He represented Finland at the 2017 World Under-17 Hockey Challenge in British Columbia (3.35 / .902 in four games played). The 6’2, 185 forward played last season for HC Davos in Switzerland and despite going undrafted in Dallas has been invited to attend Vancouver Canucks prospect camp next week. The soon-to-be 19-year-old is a two-time member of the Swiss National Junior Team. Sopa, a 17-year-old left winger, spent the past season with Bern U20 in the SC Junior A league. The 5’9, 190lb Swiss-born player represented his country at IIHF U18 Hockey Championship in April, finishing as a point per game player with 6 in 6 games. With Bern U20, he scored 21 goals and collected 35 assists in 41 games. For the first time in franchise history, the Frontenacs will have a dash of Swiss in their lineup. Derungs is a five-foot-seven, 154-pound, 18-year-old from Frauenfeld, Switzerland, who scored 52 points in 38 games last season for Kloten EHC Sports AG Jr. The 2001 born forward, will be heading into his first NHL Draft eligible season. Playing for CSKA Moskva in the Russian U17 League last season, the highly-skilled centre scored 14 goals for 32 points in 25 games played. A native of Koln, Germany, Alberg played last season with the Kolner EC Jr team where he found the back of the net 24 times and added 26 assists in just 39 games. He also added 1 assist in three playoff games. Alberg has also competed internationally for Germany in 2017-18, playing for the U18 team at the IIHF World Division 1A championships. Last year suiting up for the Green Bay Gamblers of the USHL, Zhukov played in 53 games posting a 27-19-1 record with a 2.45 GAA. He was selected in the 4th round of the 2017 NHL Draft by the expansion Vegas Golden Knights. The Södertälje, Sweden native was a member of Djurgardens IF Jr. last season where he registered three goals and 22 points in 25 games during Euro One play, followed by another three goals and nine points in 17 games during Euro Two. The second round pick by the Boston Bruins in the 2018 NHL Draft participated in the 2018 U-18 World Championship in Russia in April, registering a pair of assists in seven tournament games to help lead Sweden to a bronze medal finish. The 17-year old from Orebro, Sweden, played 23 games for AIK J20 this season recording 13-points including 6-goals. Broberg is 6’3” and 198-pounds and represented Sweden at the 2017 World Under 17 Hockey Challenge. He is eligible for the 2019 NHL Draft. The 6.02, 168-lb forward from the Czech Republic played the 2017-18 season with HC Vsetin U18 of the Czech U18 league. In 41 regular season games played, Pucek notched 26 goals to go along with 47 assists, good for 73 points. The 6’0”, 152lbs 2001-born left winger played for EC Red Bull Salzburg U18 Akademie. In 21 games, Cermak registered 8 goals, 16 assists, and 24 points. In international play, Cermak has tallied 11 points in 12 games for the Czech Republic. A member of Team Belarus U20, Zuyev attended a camp in the GTA a couple of weeks ago and demonstrated to the Steelheads’ coaching staff to be a strong d-man who exemplifies a good first pass and who skates and moves well. After spending the 2017-18 season in the Belarus men’s league, Zuyev is a promising young defenceman who the Steelheads expect to grow and develop into a solid blueliner. Maier, a right-shot rearguard, played last season at various levels with the Sodertalje SK under-18 team in Sweden, totaling six goals, 24 assists, 30 points and 45 penalty minutes in 40 games. Having turned 18 on Jan. 12, he stands five-foot-11 and weighs 156 pounds. Bukac, a 19-year-old defenseman, played in the WHL for the Brandon Wheat Kings from 2016-2018. The 6’5, 207lb Czech-born player, known for being a big-bodied shutdown defenceman, represented his country at the 2017 IIHF U18 Hockey Championship, and the 2016 Ivan Hlinka Memorial tournament. Bukac was drafted by the Boston Bruins in the 2017 NHL Draft, in the 7th round. Born in 2001, the 6’1”, 172-pound blueliner will be heading into his first NHL Draft eligible season. During the 2017-2018 season, Kolyachonok scored five goals and a total of 20 points in 43 games while suiting up for Team Belarus U18. A native of Zell (Mosel), Germany, Seider stands at 6-foot-4-inches and 183-pounds. He played last season with Jungalder Manheim U19 where he had 10 goals and 17 assists in 26 games. Seider also competed internationally recording 1 goal and 3 assists in 5 games at the IIHF Divison 1-A U-18 World Championships, where he was teammates with the Attack’s 45th overall pick Manuel Alberg. Pekar played in 56 games with the USHL’s Muskegon Lumberjacks, recording 14 goals and 40 assists during the season. He was selected in last year’s NHL Draft by the Buffalo Sabres in the 4th round. The native of Iserlohn, Germany, played 21 games for Jungadler Mannheim U19 putting up 48-points (13-35). Fleischer, 6’0″ and 154-pounds, also played 3-games for Germany’s U18 team. He is eligible for the 2019 NHL Draft. Pytlik, a 6.02, 192-lb centreman from the Czech Republic split the past season with Sazavou in both the Czech U18 and Czech3 leagues. In 21 games played with the Czech U18 squad, Jaromir recorded 13 goals and 23 assists, good for 36 points while with the Czech3 squad he notched 14 goals and 11 assists, good for 25 points. Pytlik competed Internationally at both the U17 and U18 tournaments with a combined 13 goals and 6 assists in 39 games played.